Do you have all the receipt records for your photography gear? Do you know all the specific dates of the warranties on that gear? Wouldn’t it be great if there was an easy, digital way to keep track of your camera gear and all the documents associated with it? Great news! There is an app for just that. 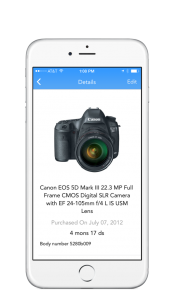 Developed by Marc Silber of Advancing Your Photography, a new app called Zither is optimized for photographers to help keep track equipment, receipts, serial numbers, owners manuals, and warranty information all in one place. Every time you buy a new piece of equipment, adding it to the Zither app is a breeze. First, you scan the bar code on the equipment’s box with the app to identify the item. Next, you snap a photo of the receipt and the serial number so they’re stored inside the product entry. Zither then automatically looks up the correct owners manual for the scanned product, providing an easy way to reference it at a moments notice. Zither also keeps track of the warranties on your camera gear, It will give a reminder as each warranty get close to its expiration date, allowing a photographer to take action on necessary repairs before they’re no longer covered under warranty. How much is this app you ask? You can get Zither for FREE in the iTunes App Store.